Limestone frog statuary. 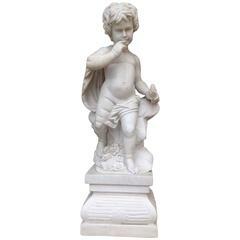 Origin: France Measurements: 19.5" W x 21.5" D x 16" H.
Pair of 19th century Italian lead garden statues depicting two classical draped children, one carrying a nest of birds. It is an iron Saint Joseph statue. 19th century French cast stone statue of three putti.